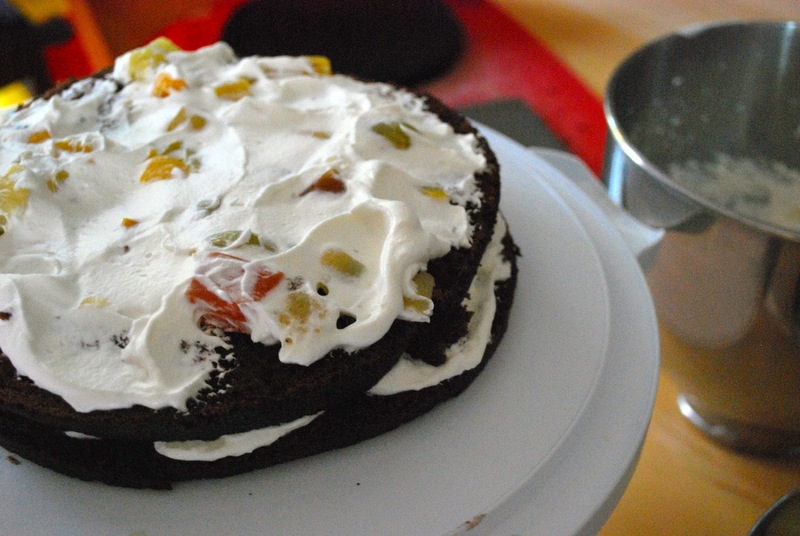 Reinventing Nadine: Black Forest Cake A La Libanese: Happy Birthday to Me! The problem with being the baker in the family is that I get to bake everybody's birthday cake and I am expected to bake my own birthday cake! But there is a silver lining to every cloud, I get to pick the cake. 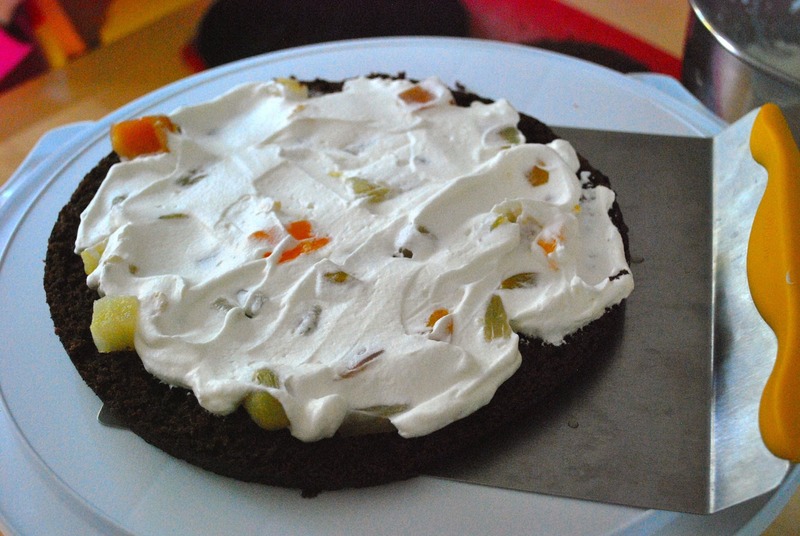 Black Forest or Forêt Noire is one of my favorite cakes, but not any Forêt Noire, and definitely not the original German dessert Schwarzwälder Kirschtorte. 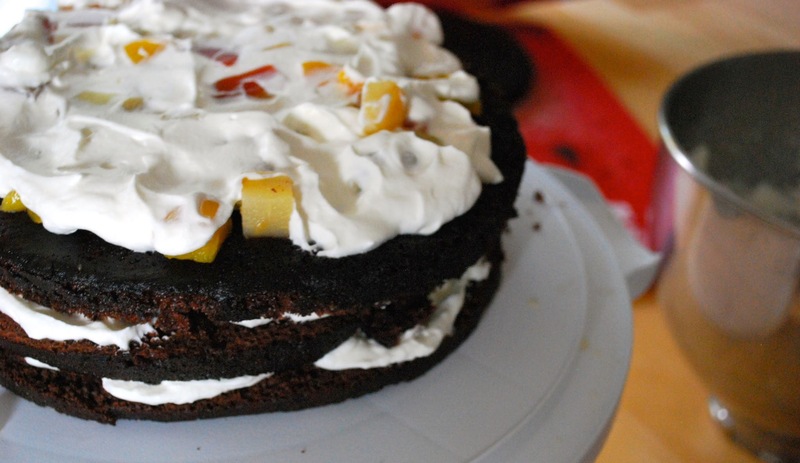 The Original dessert is made with layers of chocolate cake filled with layers of whipped cream and cherries. 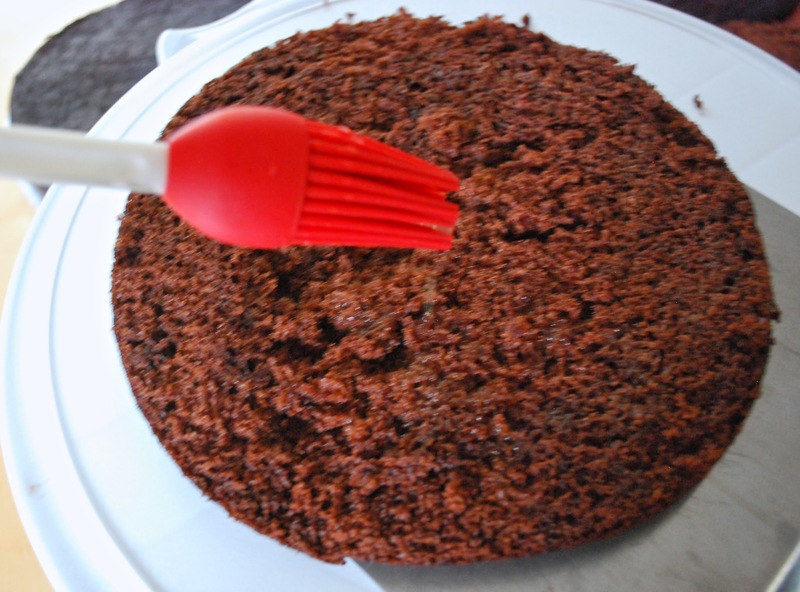 Cherry liqueur is sprinkled on the chocolate cake before layering it and is absorbed by the cake. Then it is frosted with whipped cream and decorated with chocolate flakes and cherries that had been soaking in the same liqueur. 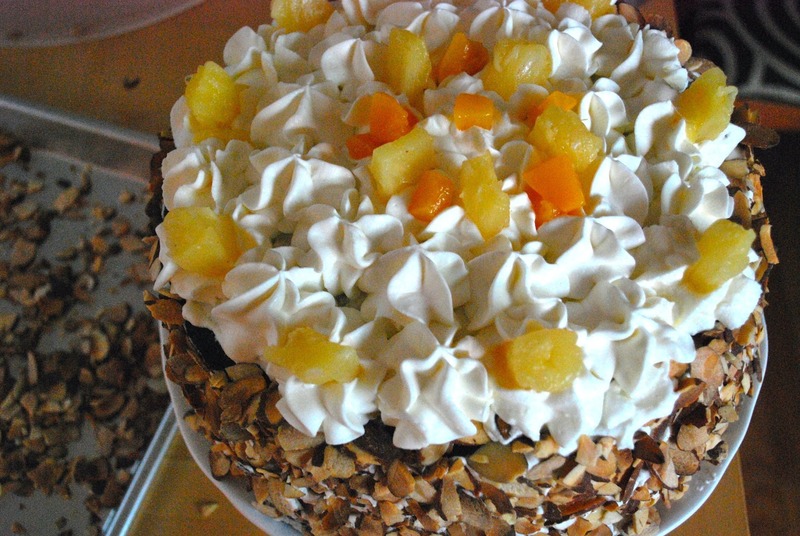 Forêt Noire a La Libanese is the Lebanese version of this cake: it is still chocolate cake and whipped cream but instead of sour cherries it is filled with canned fruit cocktail (usually grapes, pineapple and peach) and instead of the cherry liqueur, the chocolate cake is dowsed with the juice from the fruit cocktail. They don't use much alcohol in cakes in the Middle East because of religious reasons. 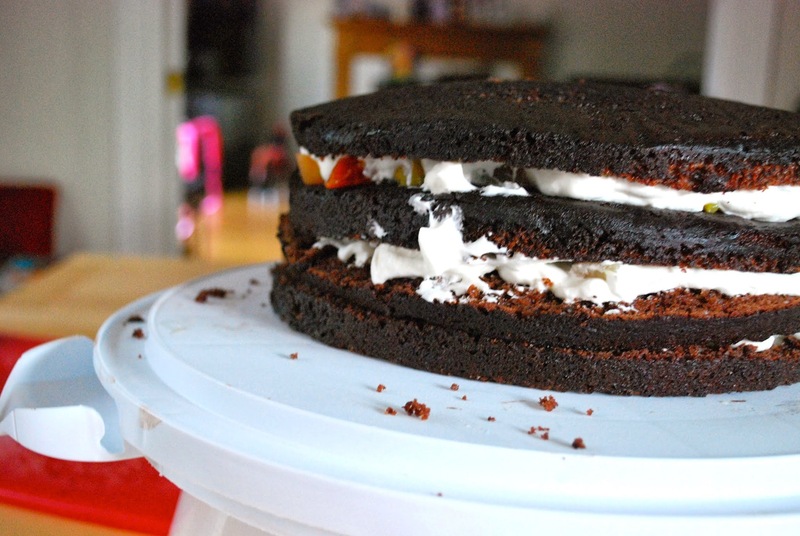 Moreover, because this cake is a very popular choice for kids birthday parties. 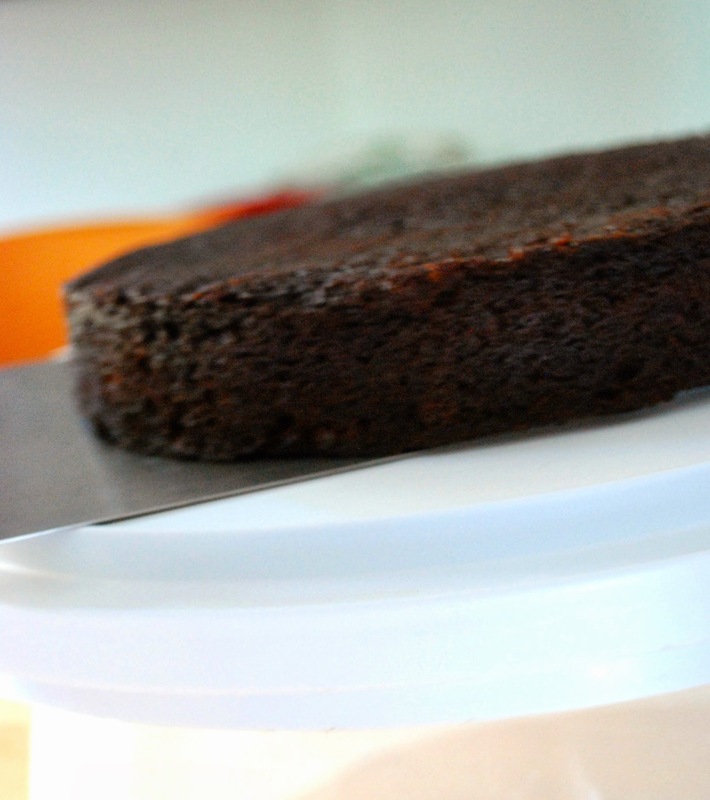 The first step is to prepare the cake pans to make a perfect cake. Click here to read about it. 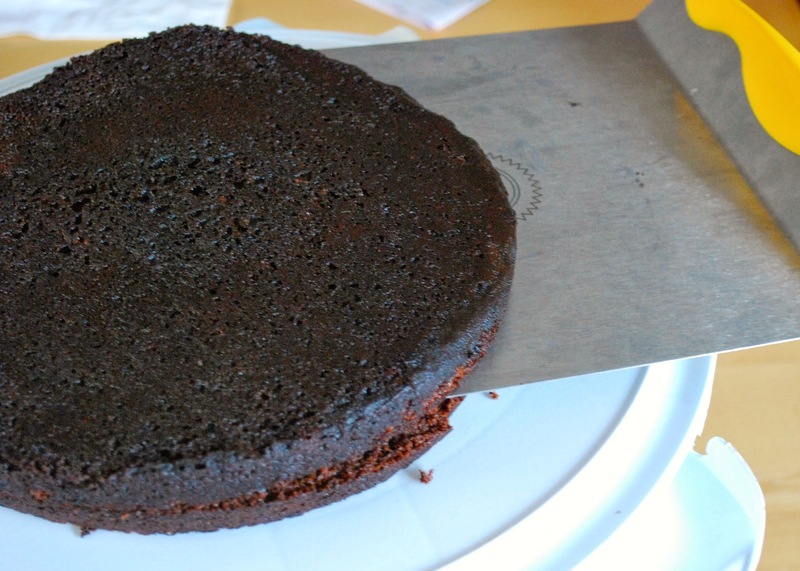 Then you have to make the chocolate cake and the best chocolate cake for this job is a sponge chocolate cake. Check out my foolproof recipe here. 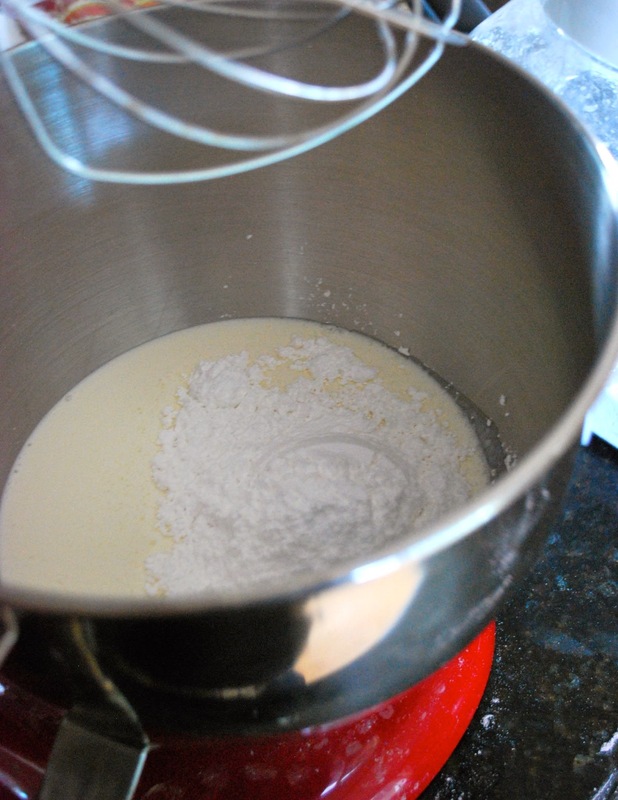 The second step is making the whipped cream. 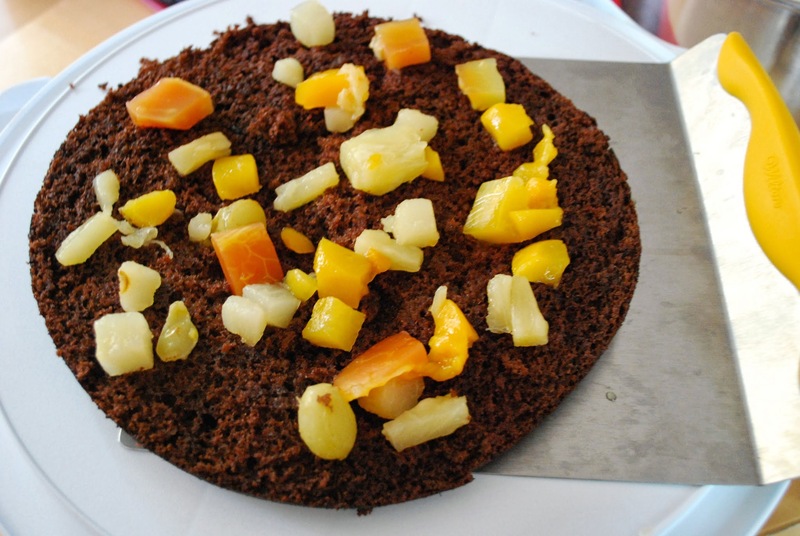 It should be made at the last moment before assembling the cake. I don't advise you to make it one day in advance. 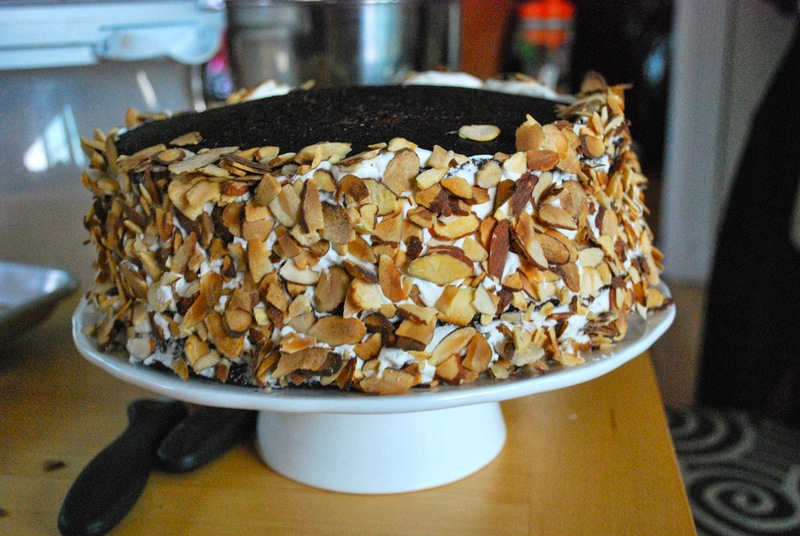 The third step is the toasted almonds: traditionally the sides of the cake are covered with chocolate flakes, I like toasted almonds. The fourth step is the fruit cocktail filling: just use canned fruit cocktail. I know, I know...it is not my style to opt for canned anything, let alone canned fruit but for some reason it works. Reserve the liquid because you will use it on the sponge cake. the last step is a dash of grated chocolate. 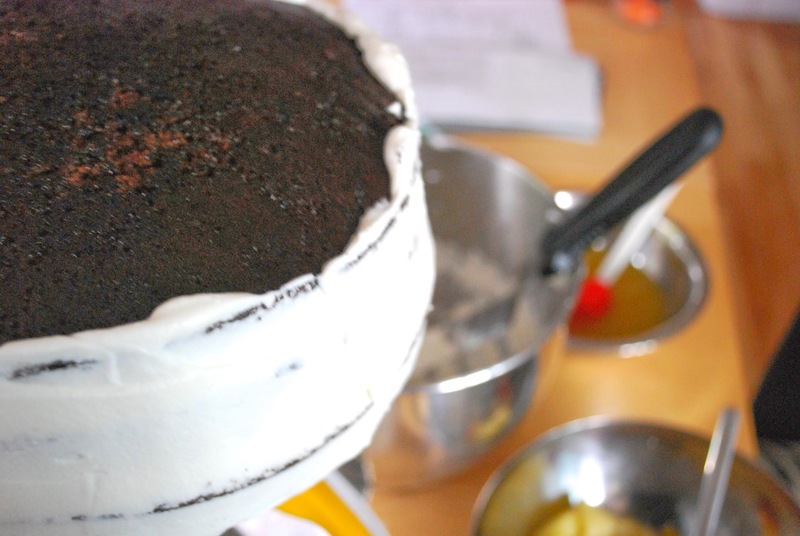 Prepare the cake pans by following my Cake Pan Preparation Tutorial, click here. 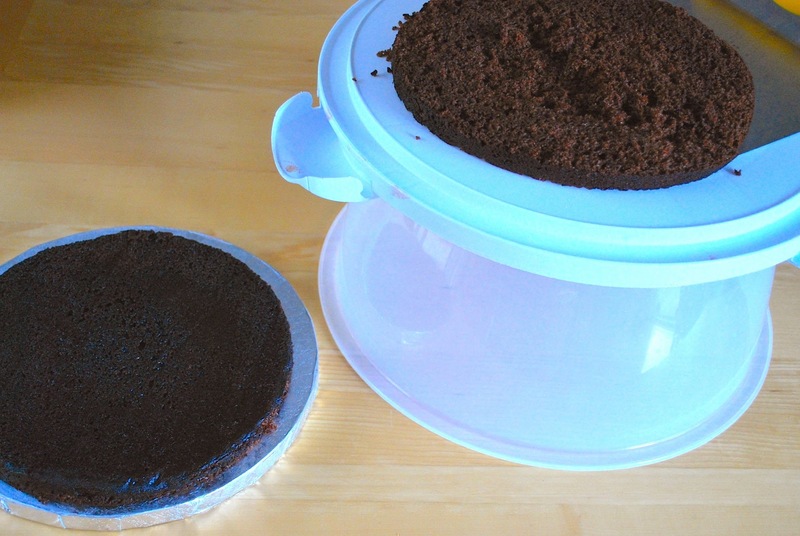 Bake the Chocolate Sponge Cake by following my Chocolate Sponge Cake Tutorial, click here. 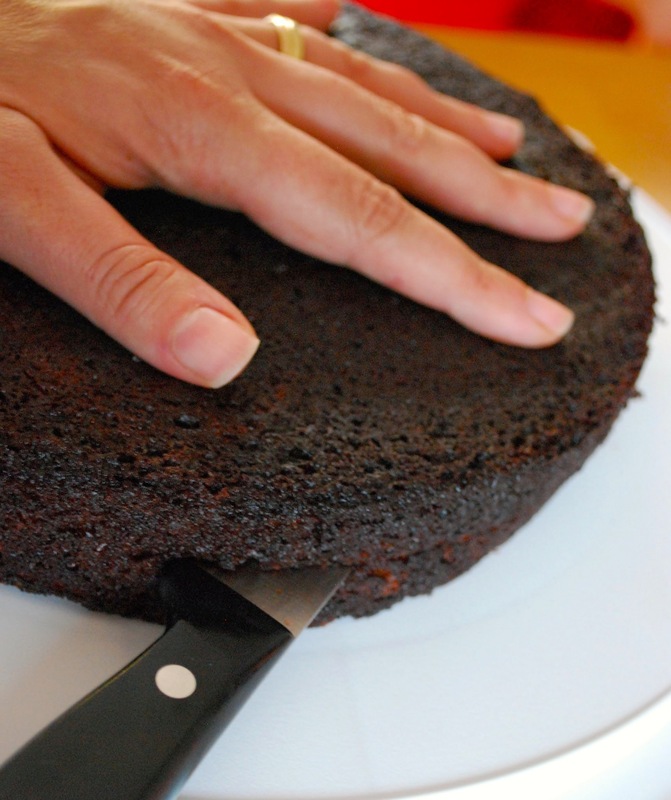 Place your first chocolate sponge cake on the turn table if using and using the serrated knife cut the cake in the middle to create two equal layers. Repeat with the other cake. Now you have four layers. 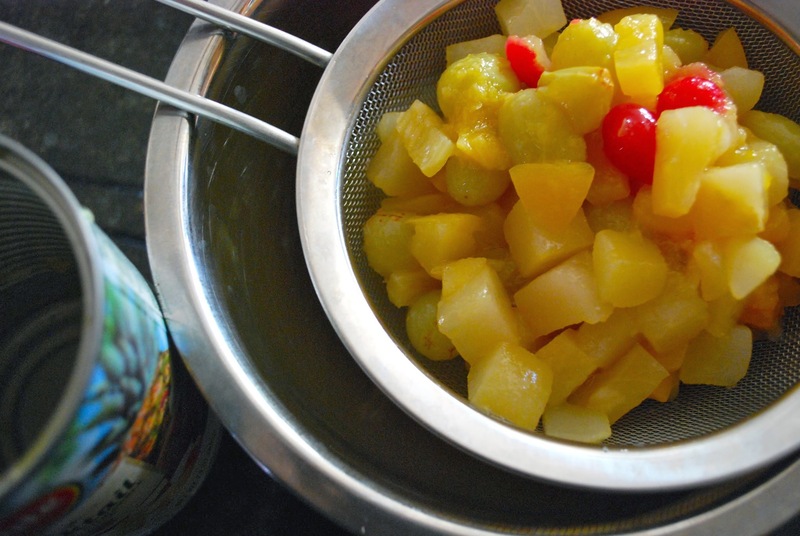 Open the can of fruit cocktail and separate the fruit from the liquid by using a strainer. Reserve the liquid because you will use it. 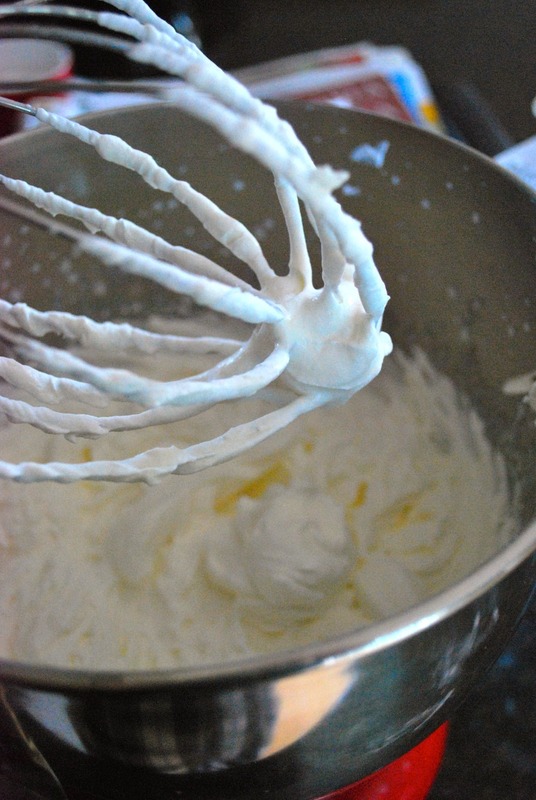 Make the Whipped cream by adding the heavy cream and the powdered sugar in the mixer and whip until it is stiff. Don't overdo it because over whipped cream will turn to butter. 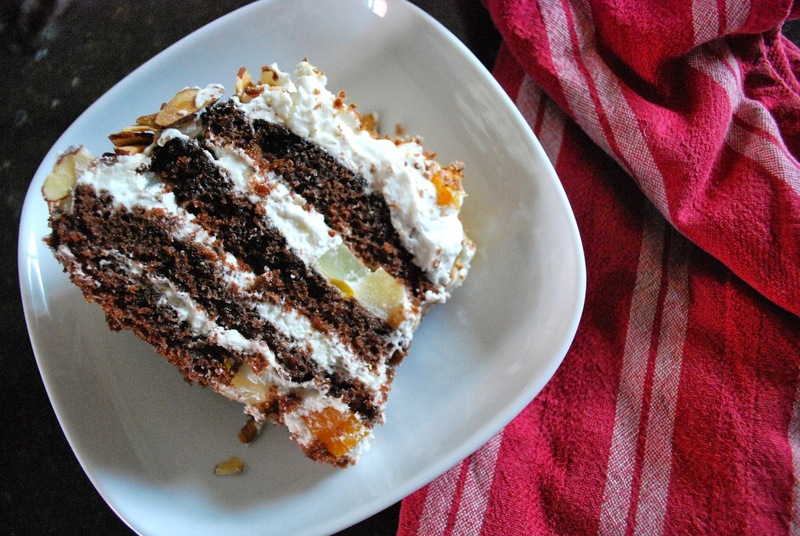 Add some fruit on the cake and spread them all over. Add a layer of whipped cream. 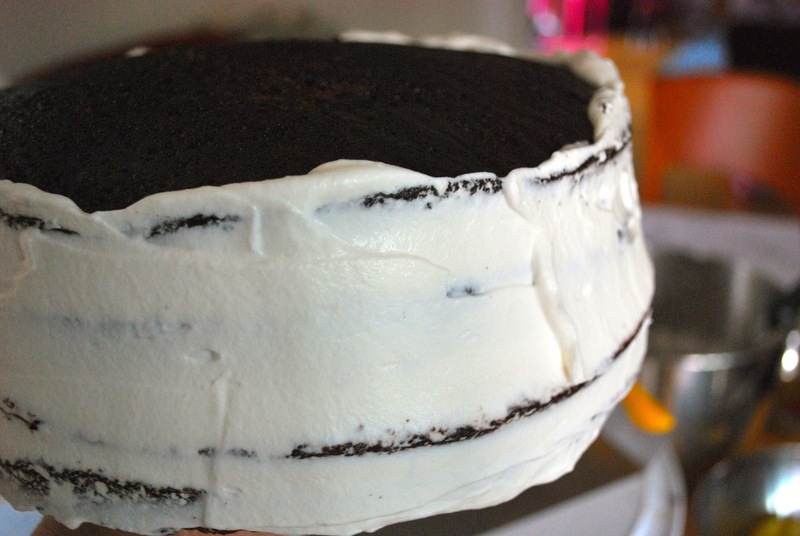 Remember that you will have three layer of this filling plus the frosting so don't overdo it. Smooth it using a spatula. Add the second layer, repeat as above with the liquid, then fruit then whipped cream. Reserve about one cup of the remaining whipped cream for decoration. 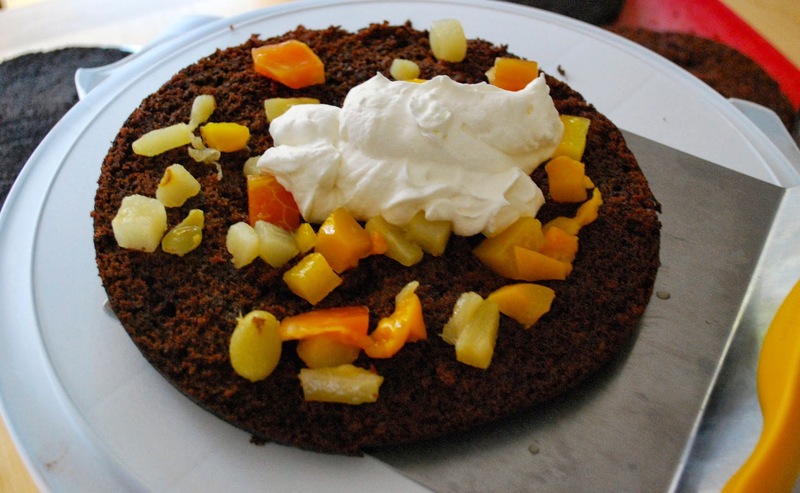 Now use the rest of the whipped cream to frost the cake. I like to use a slanted spatula. 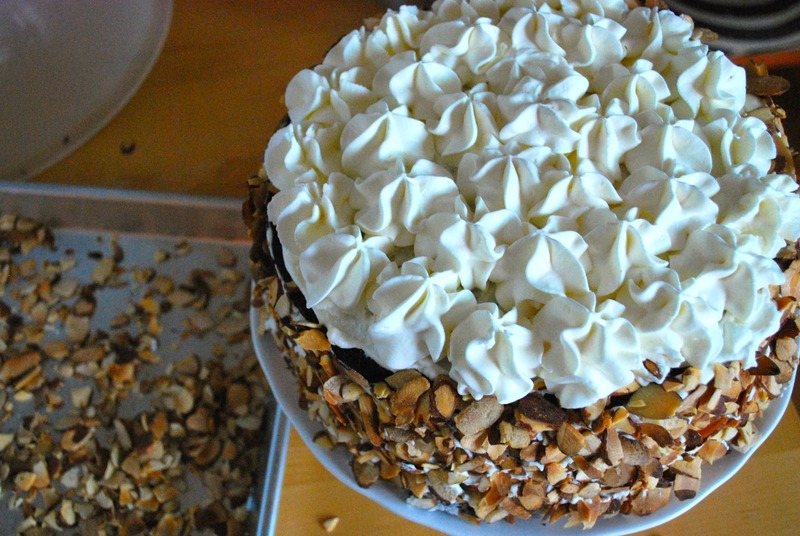 Remember that the cake will be covered in almonds so the frosting does not need to be perfect and smooth. No one will see it. 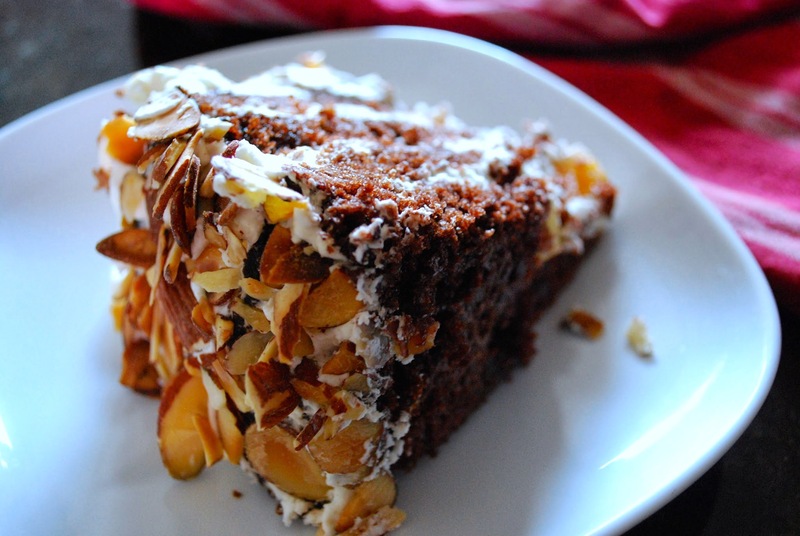 Refrigerate the cake while toasting the almonds. 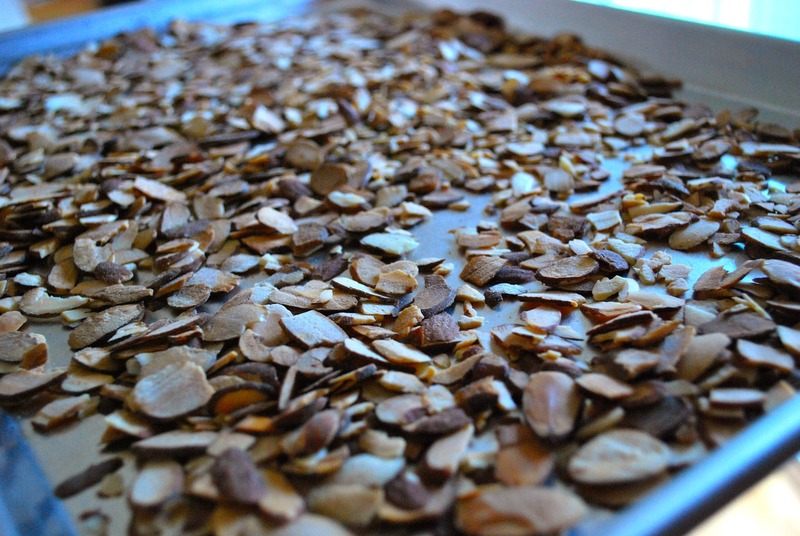 Preheat oven to 350 F. Spread the slivered almonds in one layer. Don't grease the baking sheet. Toast them until golden for about 5 minutes. Do not remove your eyes off of the almonds in the oven. They will turn to black in a second. This is the tricky and messy part. Be prepared for major cleaning up after this step. Yes it is worthy. Bring the cake out of the fridge and place on turntable if you have one. 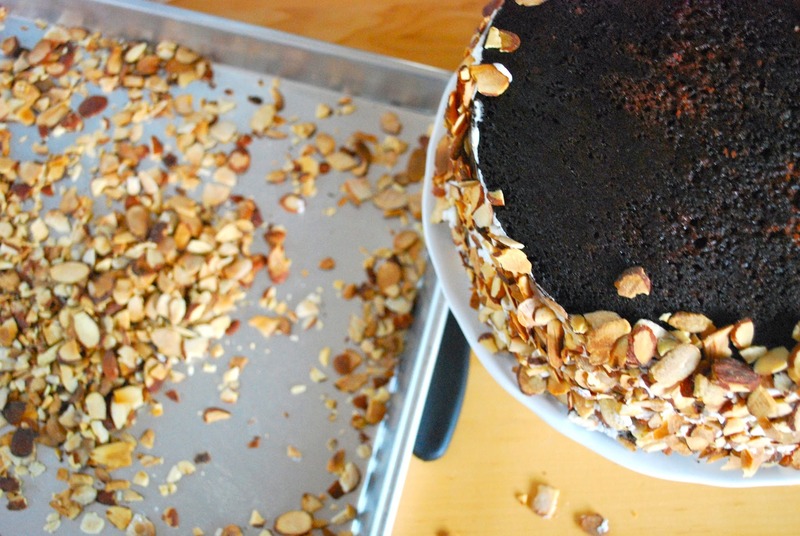 Take a bunch of the toasted almonds and stick them to the sides of the frosted cake. 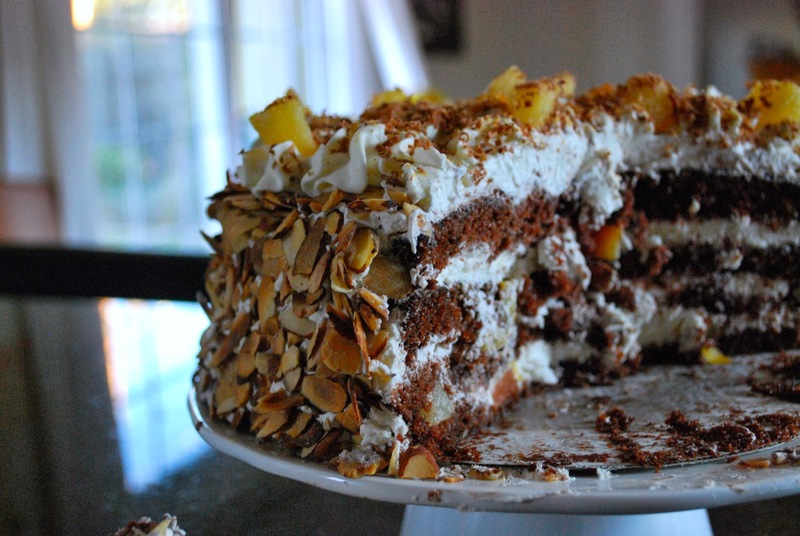 Make sure that the almonds are sticking to the cake. Repeat until all the sides are neatly covered. Prepare your pastry bag with the coupler and the star tip. To read how to prepare your pastry bag, click here. Pipe big stars on the top of the cake. If you still have enough whipped cream pipe all around the sides of the cake. I did not have any left. Decorate with the remaining fruit. Sprinkle with chocolate shaving using a grater to grate the chocolate. Refrigerate. This cake tastes a lot better after few hours of refrigeration. Enjoy! Happy Birthday to Me! 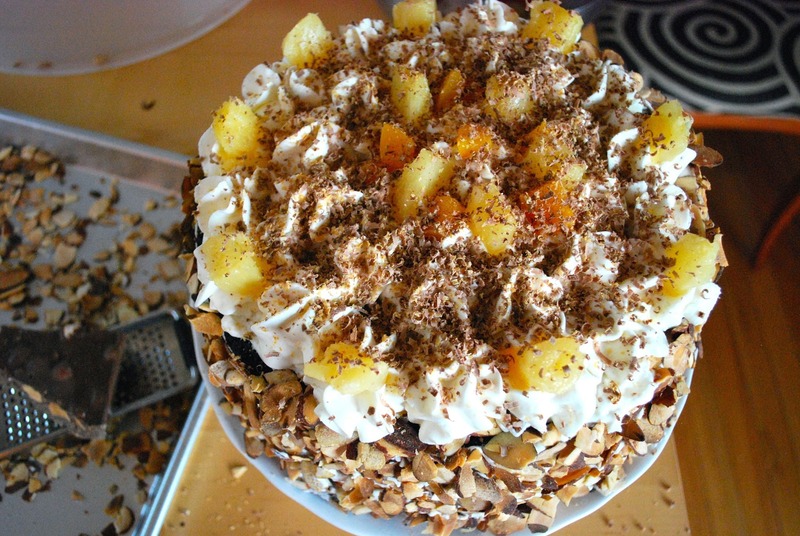 I have had Foret Noire cake in Lebanon so many times and its my favorite as well .I have been in the United States for over 30 years and I can never find this amazing cake .We have black forest cake , but clearly that's not what I looking for . Your blog explained a lot to me . Thank you so much for posting this amazing recipe. 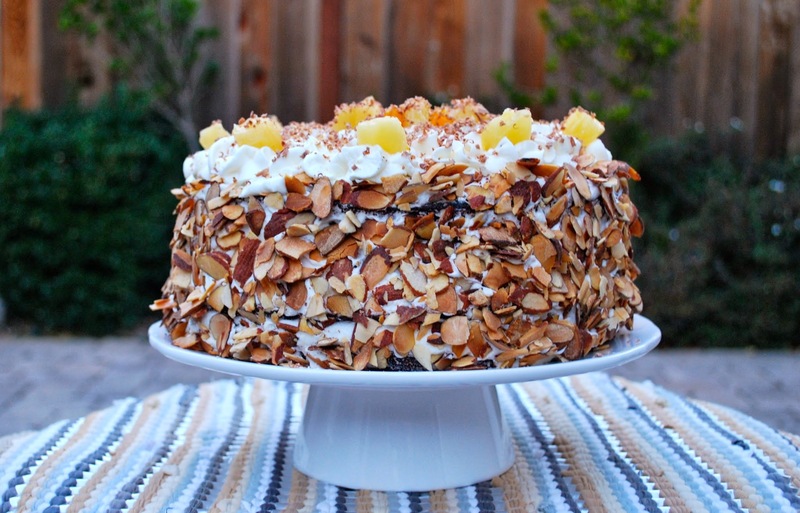 I can't wait to bake the cake and try it .I do have 1 question .Can I use shaved chocolate instead of almonds ?